This new book from The Barefoot Guide Connection is about real social change practices and is drawn from many countries in the world. It contains stories, analyses, and ideas, plus poems and illustrations. Compiled by nearly 40 social change activists and practitioners, it is written for activists, civil society leaders and practitioners. 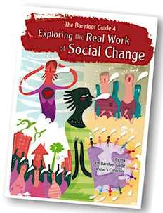 It is not a book of easy answers but aims to provide a feast of experiences, learnings and questions, all asking “What is the real work of social change?” Download for free from the Barefoot website. This new report summarises findings from a two year global action research project that sought to understand how and why volunteering affects poverty and contributes to sustainable development. Conducted by VSO and IDS, the Valuing Volunteering research took place in the Philippines, Kenya, Mozambique and Nepal and explored volunteering across different development contexts and systems. Using participatory systemic action research it worked with local partners, communities and volunteers to reflect on how and where volunteering can contribute to positive, sustainable change. Responsive governments and empowered citizens are important conditions for inclusive development. But what can governments and civil society do to make sure that all voices are heard? This course, run by The Hague Academy for Local Governance, looks at how governments can inform and involve their citizens, including minorities and marginalised groups. Participants will also learn how civil society can be strengthened in such a way that citizens can hold their governments accountable and bring their concerns to the table. The application deadline is 3 April 2015. For more information please go to The Hague Academy website or phone (31) 70 3738 695. This latest engaging edition of Housing by People in Asia from ACHR reports on how the urban poor in six Asian countries have come together to define their own poverty lines. Rarely consulted in the global political debates as to what actually constitutes poverty, this project has enabled those that understand deprivation the best to analyse what it means for them and where lines can and should be drawn. Challenging the notion that $1.25 a day (the World Bank’s one-size-fits-all definition of absolute poverty) could ever clearly separate the poor from the non-poor, they explore the multiple dimensions of poverty in different contexts and what they can do together to bring about change. In this new research report from IDS, Marjoke Oosterom and Lloyd Pswarayi present the findings of case study research with youth in six locations in Zimbabwe, carried out within the Power, Violence, Citizenship and Agency (PVCA) programme. It shows how young people experience growing up as citizens in a country known for its repressive regime, and highlights the differences for young men and young women. Feedback loops – new buzzword, old practice? In this new blog from Better Evaluation, practitioner Irene Guijt explores what lies behind the term “feedback” which is increasingly being used by organisations and businesses in a variety of ways. She asks what is actually meant by this term and its permutations - such as feedback mechanisms, client feedback and feedback loops - and why there is a sudden surge of interest in it. She also questions whether and how this is different to more familiar and longer standing modes of monitoring and evaluation. The World Health Organization (WHO) estimates that around 15 per cent of the world’s population, or one billion people, have some form of disability. According to the United Nations Development Programme (UNDP), 80 per cent live in poor countries, where communities are already more vulnerable to disasters and crises such as Ebola epidemics, with people with disabilities often disproportionately affected. Members of the Participation Team at IDS were recently asked for their "top book of all time on participation". This week it’s the turn of Robert Chambers who’s added a second - crucial - book into his list which is:..